More cases of measles have been reported four months into 2019 than were reported in all of 2018, the Centers for Disease Control and Prevention reported Monday. So far, 387 cases have been reported in 15 states — Arizona, California, Colorado, Connecticut, Georgia, Illinois, Kentucky, Michigan, Missouri, New Hampshire, New Jersey, New York, Oregon, Texas, and Washington — the CDC said. There were 372 cases of measles reported in 2018. The agency added that the United States has now experienced the second-largest number of reported measles cases since the disease was considered eliminated in 2000. Since the beginning of the year, six outbreaks have been ongoing in Santa Cruz County and Butte County in California; Rockland County, New York; New York City, Washington state and New Jersey. Rockland County last week declared a state of emergency as the number cases there surpassed 150, and restricted people under age 18 who are not vaccinated from being in public places. The largest number of measles cases reported in the U.S. since 2000 was 667 in 2014. Most of these measles cases are a result of people not getting vaccinated before traveling and bringing back the disease from countries like Israel, Ukraine and the Philippines. Eighty-two people brought measles to the U.S. from other countries in 2018. This is the greatest number of imported cases since measles was eliminated from the U.S. in 2000. 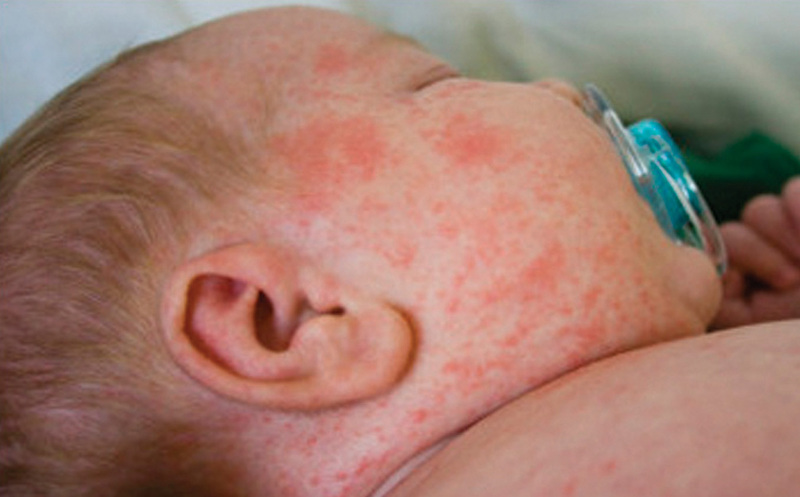 Measles is a very contagious disease, spread by air and contact with contaminated surfaces. According to the CDC, the measles virus can live for up to two hours in an airspace where the infected person coughed or sneezed. If other people breathe the contaminated air or touch the infected surface, then touch their eyes, noses, or mouths, they can become infected. Measles is so contagious that if one person has it, up to 90% of the people close to that person who are not immune will also become infected. Regardless of what some people tell you, measles is not a harmless disease. Before vaccination, hundreds died annually in the United States from measles, thousands were hospitalized, and many were left with permanent damage to their ears, eyes, or brains. The CDC says that measles can be serious in all age groups. However, children younger than 5 years of age and adults older than 20 years of age are more likely to suffer from measles complications. In the decade before 1963 when a vaccine became available, nearly all children got measles by the time they were 15 years of age. It is estimated 3 to 4 million people in the United States were infected each year. Also each year, among reported cases, an estimated 400 to 500 people died, 48,000 were hospitalized, and 1,000 suffered encephalitis (swelling of the brain) from measles. This entry was posted in Current Events, News, The Culture. Bookmark the permalink. This is an interesting article on measles. Such as, one strain is rubeola, and the other is rubella. With the names so close in sound and spelling, I didn’t know they were different. Note that UPI says “four months into 2019…”. Since this is April 1, we are only THREE months into 2019. Unfortunately, with so many parents refusing to vaccinate, this will only get worse, as we all know. And we have illegals possibly bring in more contagious diseases every day! I had a very dear friend that got the measles as a child (many years ago) that lost her hearing for life. Illegals are a problem for sure, but look at how many American citizens don’t vaccinate their children. It’s bad all around.